How to Convert PowerPoint PPT to Video and Burn PPT to DVD on PC? When your device fail to make PowerPoint presentations, just convert PowerPoint 2016, 2013, 2010, 2007, 2003, 2002, 2000 files to video like convert PPT to AVI, PPT to WMV, PPT to MPEG, PPT to FLV, PPT to MP4, PPT to VOB, PPT to 3GP/3G2, PPT to MOV, etc or convert PowerPoint to DVD for easier watching. Whether you want to present PPT on PC or Mac without installing Microsoft Office PowerPoint, or wish to watch the PPT files on your iPad Pro, iPhone 7/7 Plus, iPhone 6S/6S Plus, Samsung Galaxy, Nokia Lumia, etc when you are in the train, even if you only want to upload your PowerPoint to YouTube for sharing, you can use PPT to Video/DVD Converter and follow the description as below to have a try. Support NTSC and PAL DVD. Whether you want to convert PPT to video or DVD, you should keep the following points in mind. 1. You must install Microsoft Office PowerPoint on the computer where you use this software to convert PowerPoint to video or DVD. 2. When you use this program to convert PowerPoint to video or DVD, you cannot open your PPT files with PowerPoint. 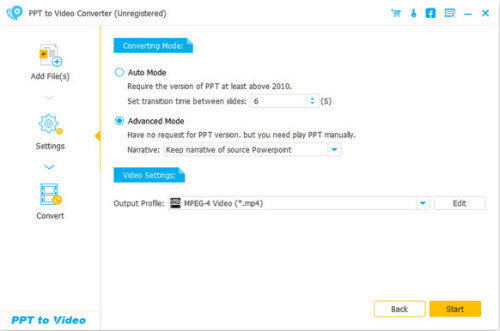 Part 1: How to Convert PowerPoint to video with PPT to Video/DVD Converter? Feel annoyed with showing piles of PowerPoint by sliding page by page? Feel embarrassed when Microsoft Office fails to work in your project meeting? For avoiding such an inconvenience brought by PowerPoint, you can try to convert PPT to video for easy presentation. 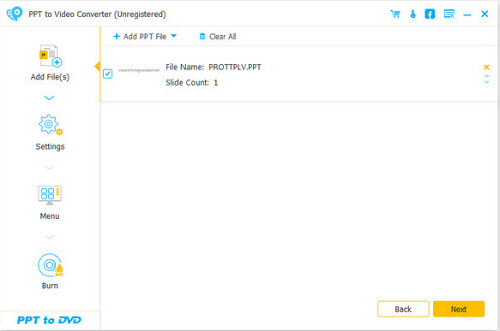 Click the “Add PPT File(s)” button to import PPT files to this converter. You are also allowed to import batch files or a folder for fast converting. Here you need to make settings according to your personal needs. Auto Mode: When you choose Auto Mode, you must make sure your PPT version is at least above 2010. And you can let your PowerPoint pages slide automatically by setting a transition time. Advanced Mode: When you choose Advanced Mode, it means you can keep/ignore/record narrative for your PowerPoint files. Here it accepts any version of PowerPoint, but you need to play PPT files manually. 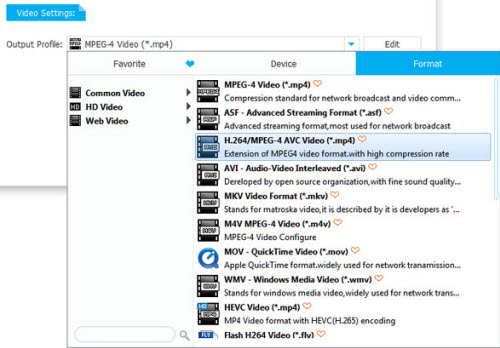 In this option, you can choose one output format for your video, MP4, AVI, WMV, MOV, M4V, etc. are all for your reference based on your own player. You can choose the formats by “Device” or “Format”, and click the heart shape to add it to your “Favorite” format. After making all settings, you could click the “Start” button to convert the PowerPoint files. After the converting process is completed, you can open the folder to check it. Part 2: How to Convert PowerPoint to DVD disc/ISO file with PPT to Video/DVD Converter? It is very common to find the attached DVD tutorial with PowerPoint images viewing in your products. Here you can also make it. If you have some important PowerPoint files to keep, maybe the safest way is to create a DVD disc. Yes, here you could keep it for a long time. 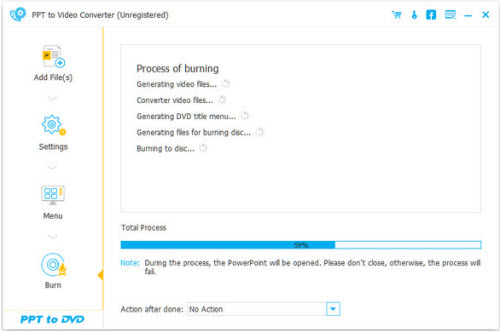 Follow the guide as below to convert PowerPoint to DVD. Download this PowerPoint to DVD maker, run it after installing it successfully on your computer. Click “Burn into DVD”. Click the orange “Add PPT File(s)” button; Here you can also add PPT files in bulk. Before you create PowerPoint files into DVD, you are required to make settings firstly. Converting mode: Similar to PowerPoint to Video mentioned above, you can make manual or auto settings for your PowerPoint slide show. DVD Settings: DVD Settings lets you to set TV standard and aspect ratio. Menu: After making settings, click “Next” to edit menu. Here you are given templates background images option. Also, if you like, you could add background music for your PPT file. After making all settings, you come to the last step. Here, you are able to burn to DVD disc or ISO file. And the burning engine, volume label and DVD burner. After making those settings, you could click “Start” to turn PowerPoint to DVD. PowerPoint to iPhone/iPad-How to Play PowerPoint (PPT) on iPhone or iPad?